Tomorrow the BYU "Cardiac Cats" Cougars will stroll into Ann Arbor sporting a 2-1 record,with both wins coming on big plays in the final moments of the game. BYU has shown tenacity after losing their starting quarterback Taysom Hill in the first game of the season against Nebraska. New starter Tanner Mangun has looked every bit as good as Hill thus far. Here is my offense/defense breakdown, and final score prediction. Through three games we know this about the Wolverine offense: the passing game is a, well it's a mess. With no threat of a downfield passing game despite speed at the wide receiver position and players who are capable of stretching the field, the Wolverines are nothing more of a dink and dunk passing team, which is usually the secondary option. Now, the Wolverines were able to march down the field against Utah at the end and score a touchdown passing the ball, but other than that it has not been very effective. To that point, however is the fact that Michigan has not needed a passing game in the two games since Utah. Jim Harbaugh is a classic style coach who looks to pound the ball first, and with a bevy of talent at the running back position, why not? Jake Rudock is going to need to step up this week, and this game will be tightly scored, and there will be times when Michigan needs to throw the football basically an entire drive. The receivers are going to need to create separation, and give Rudock a chance to throw to an open receiver. The offense line needs to continue its development, and give Rudock and the receivers time to create and find open passing lanes. I have been waiting for a freshman receiver to step up, and I believe Drake Harris will have a very good game, and Grant Perry shall redeem himself for his miscues. The running game is expected to be as it is. Strong.Ty Isaac looked excellent last week, and DeVeon Smith will continue to build on his good looking season. Derrick Green is said not be in the dog house with the coaching staff despite being buried against UNLV last week, and Drake Johnson is slowly getting more involved. Johnson is the best pass catching back the Wolverines have, and if he is truly at 100% I expect a heavy dose of Johnson in the passing game. For BYU, Mangum can nearly do it all. He can run, and he has a very strong arm that will put pressure on opposing secondaries. However, he does throw some interceptions, he has three interceptions this season to go along with his four touchdowns and 664 yards through three games. BYU has two big running backs, Adam Hine stands at 6-1, 216lbs, and Algernon Brown, who is also 6-1 but 235 pounds. Hine has gotten a large bulk of the carries, but Brown in tough to bring down. Hine has 279 yards, and two touchdowns this season. According to BYU's stat page, Mangum has -42 rushing yards this season, mainly due to sacks, but he is very much a threat to take off out of the backfield at any point. The Cougars have three wide receivers with 170 receiving yards or more. That will cause the Michigan secondary to be under a bit of pressure in this game. The fact Mangum can sling the ball all over the field and has three pass catchers who are very talented will force the defense to play at a high level. 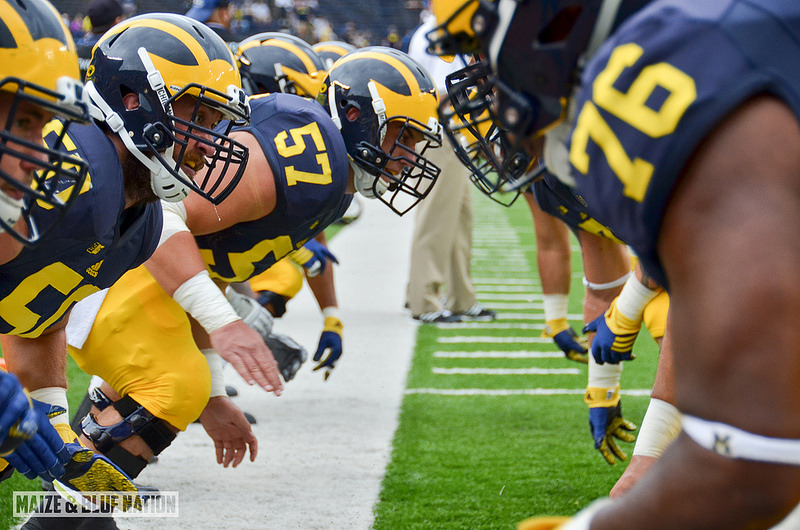 The Michigan defense will need to be top notch this week. The Cougar offensive attack will be quick. I expect the Cougars to come out firing, and I expect the Wolverine defense to be up to the challenge. Michigan's pass rush will put enough pressure on Mangum to make him feel uncomfortable, no doubt. But the collapsing pocket will either allow Mangum to use his feet to break off a big play, or sling it downfield. The linebackers for the Wolverines will need to stay alert, and one will likely be spying Mangum all day. With that, the secondary needs to stay tight in coverage and not allow Mangum to fire one deep to an open receiver. I believe Michigan will keep Mangum and the Cougar offense in check most of the game, but I do expect some slip-ups here and there that could lead to big plays and eventually points. All teams, even the best make mistakes. There will be a point where Mangum breaks off a big run under pressure, and there will be a point where he hits an open receiver in broken coverage. I do think Michigan, however will force at least two turnovers from Mangum trying to do too much, whether it be force a pass, or fumble trying to scramble away from pressure. The BYU defense does not have quite as big a challenge on their hands. Michigan's offense has sort of been a question mark going into the season, and questions still remain. Kai Nacua is a very good player, and if Rudock does try to stretch the field he will definitely need to avoid him, and Wolverine players need to keep an eye out for his dirty play and keep a level head. I believe the BYU defense will look good against the Michigan offense early, but with great offensive minds and strategies on the Michigan sideline adjustments will be made and the Wolverines will be able to score. The key for the BYU defense is getting the Michigan offense off the field. The upside to the dink and dunk passing, and running game for Michigan is wearing the defense down. If BYU cannot get their defense off the field, and Michigan is able to drag out drives, the Cougars are in big trouble. This is going to be a great game. It may not be exciting fan wise, because I don't expect an abundance of scoring due to Michigan's approach so far through three games, and the high level of intensity from the Wolverine defense. BYU players said earlier in the week this game will be a bloodbath, and from other news outlets the Cougars have been deemed as very dirty players. Harbaugh is a high intensity, high enthusiasm coach but he gives off a 'zero tolerance' type of attitude, so I don't expect much pushing or shoving back from the Wolverines. The key is to keep a level head and stick it to them by scoring points. On twitter this week I projected a 20-17 BYU victory, also stating that my prediction was very likely to change throughout the week. It has, and has changed a lot. I have a good feeling about this game for the Wolverines, and think a win could sneak them into the Top-25, or at least give them a few votes.